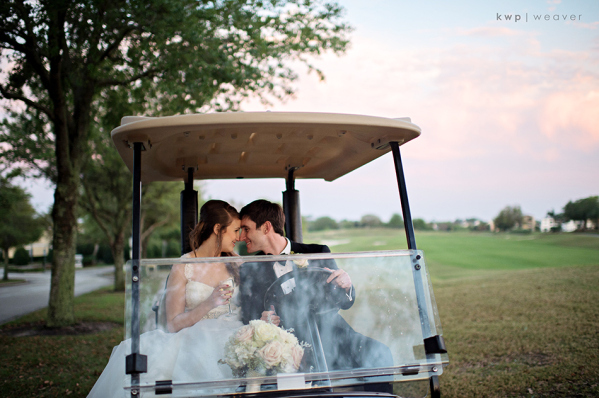 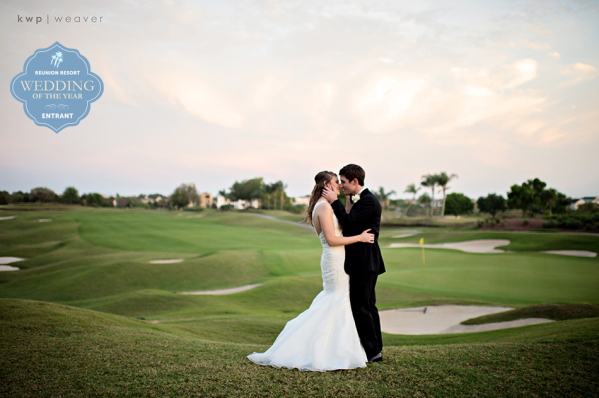 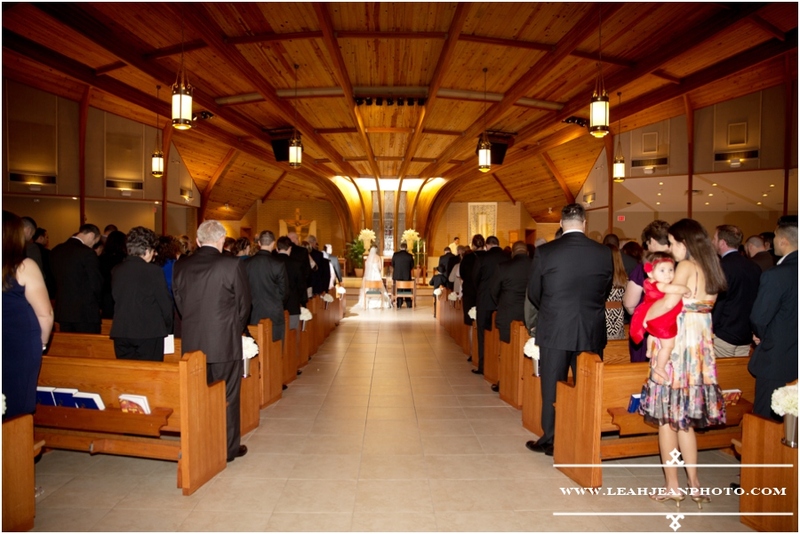 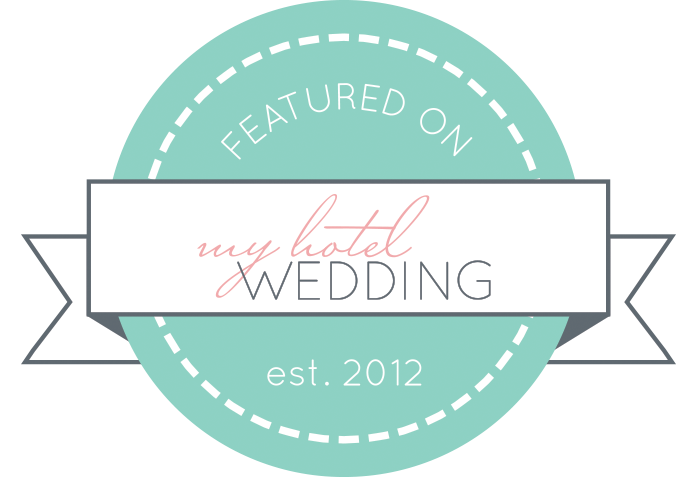 Julia and Dave had a magical wedding at the Ritz Carlton Orlando Grande Lakes. 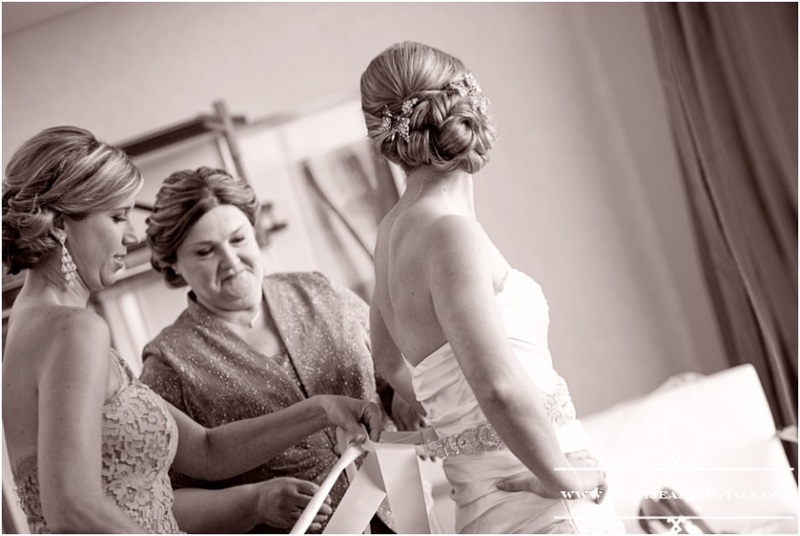 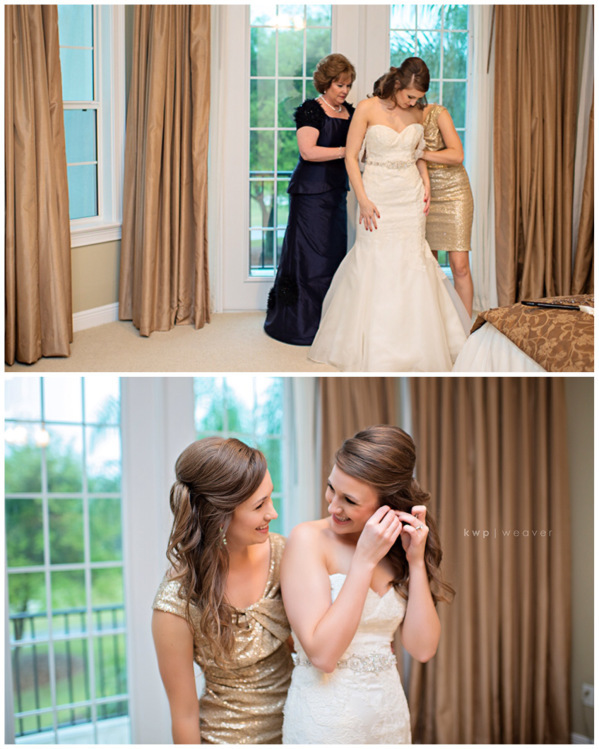 Coordinated by the extraordinary wedding planners at Blush by Brandee Gaar and photographed by Kristen Weaver Photography, their wedding day was full of gorgeous details. 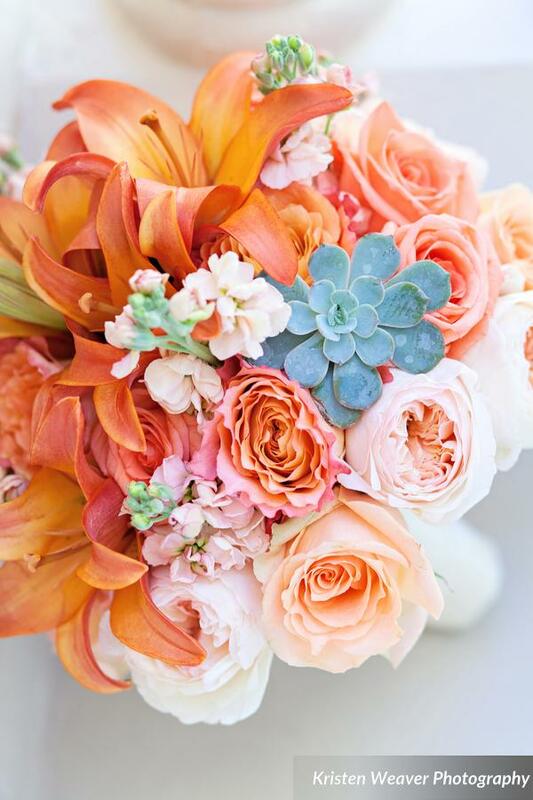 The accent colors for the day were tones of peach, coral and orange. 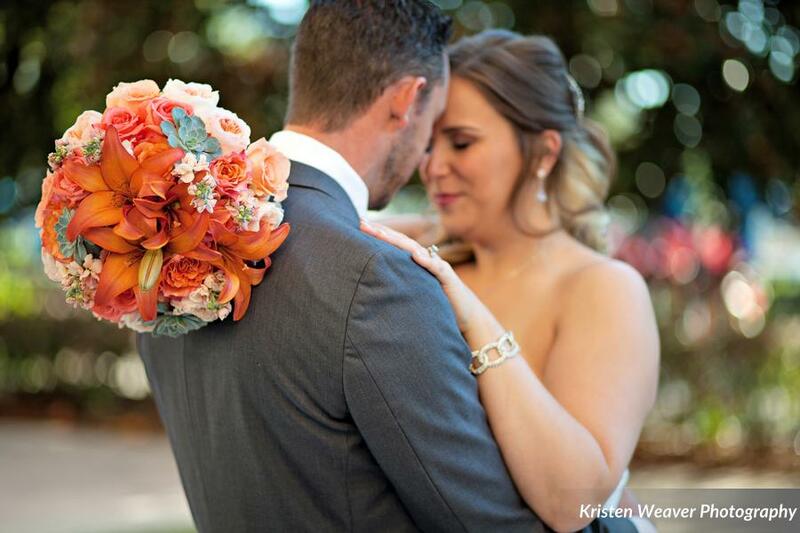 We created a coral rose boutonniere for Dave, adding succulent petals to coordinate with his bride’s bouquet. 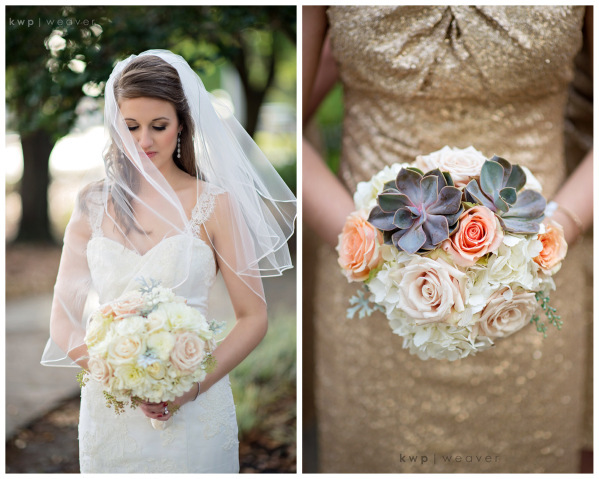 Julia’s bouquet was comprised mostly of a variety of roses in shades from blush pink to peach to coral. 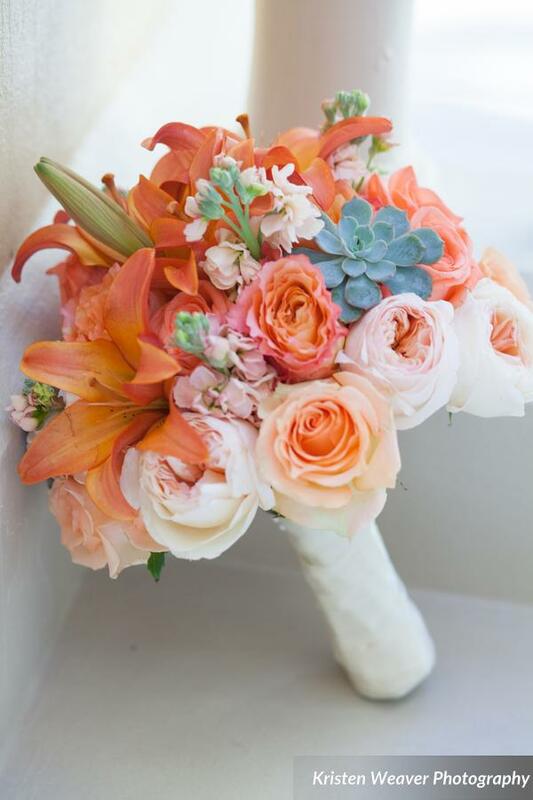 Bold orange lilies and green succulents provided contrast and added a modern accent. 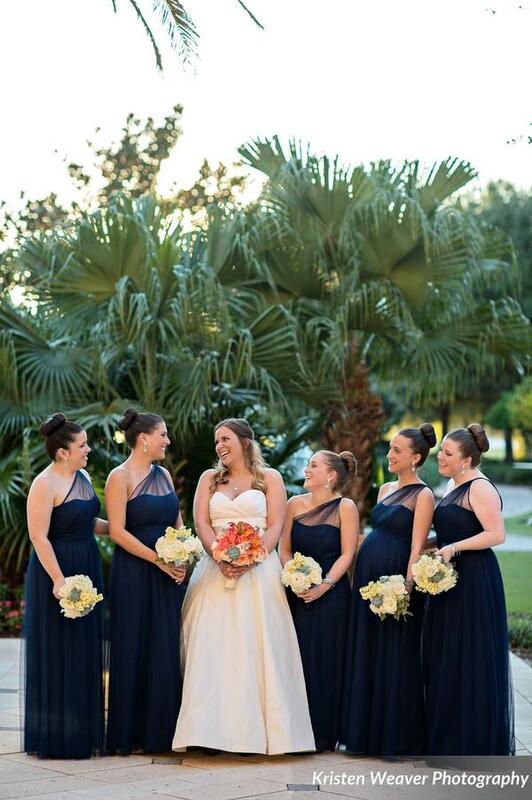 For Julia’s bridesmaids, we kept the types of flowers similar to those in her bridal bouquet. 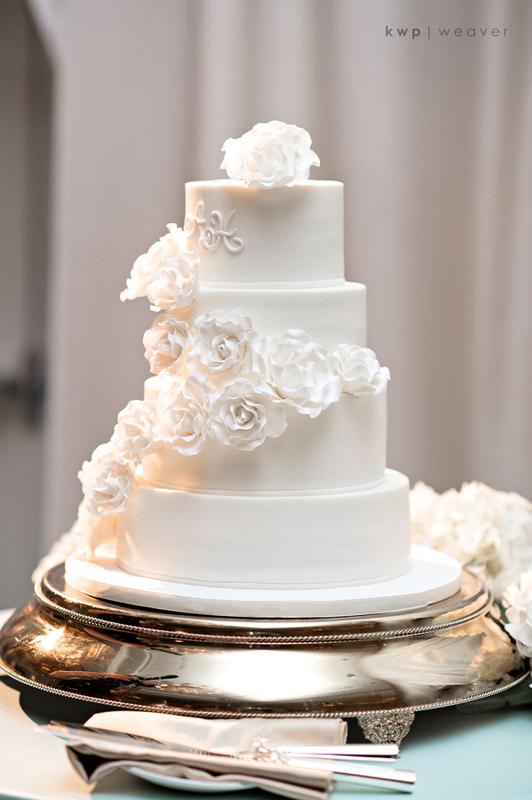 To create a sophisticated look against their dark navy dresses, the roses and hydrangea were all shades of cream and white and tinges with soft green. 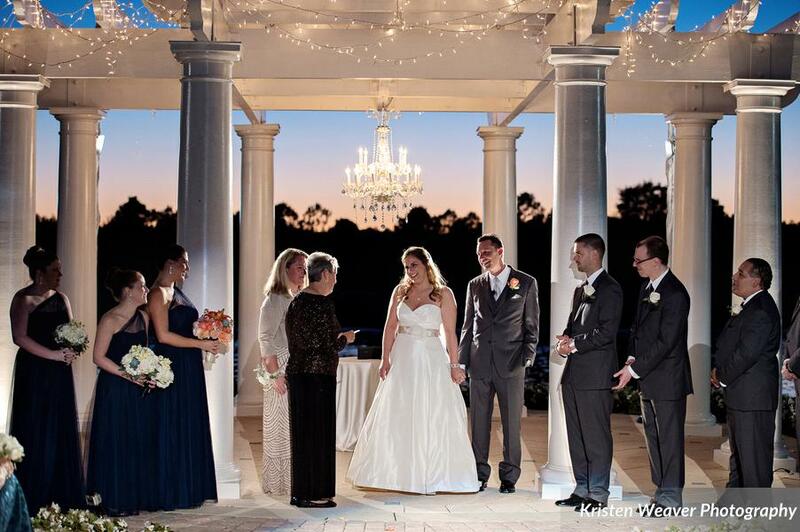 Julia and Dave’s ceremony took place outdoors at sunset. 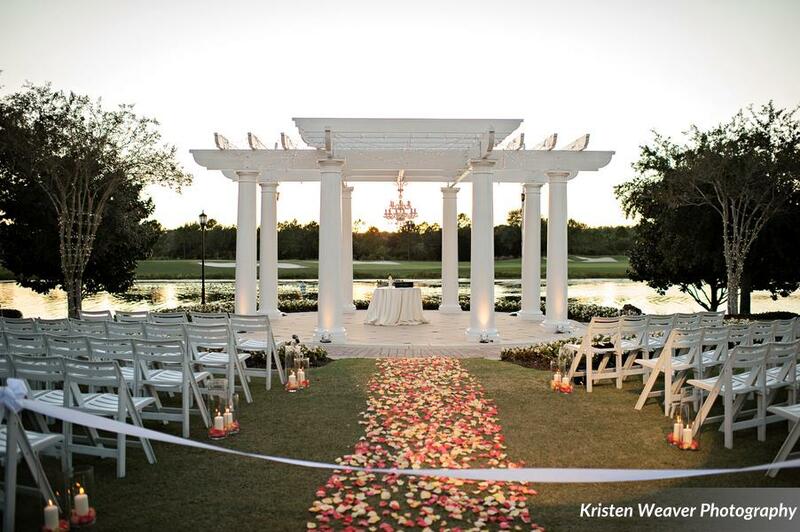 The aisle was lined with vessels of rose petals topped with pillar candles, and a beautiful bridal aisle was created with more peach and coral rose petals. 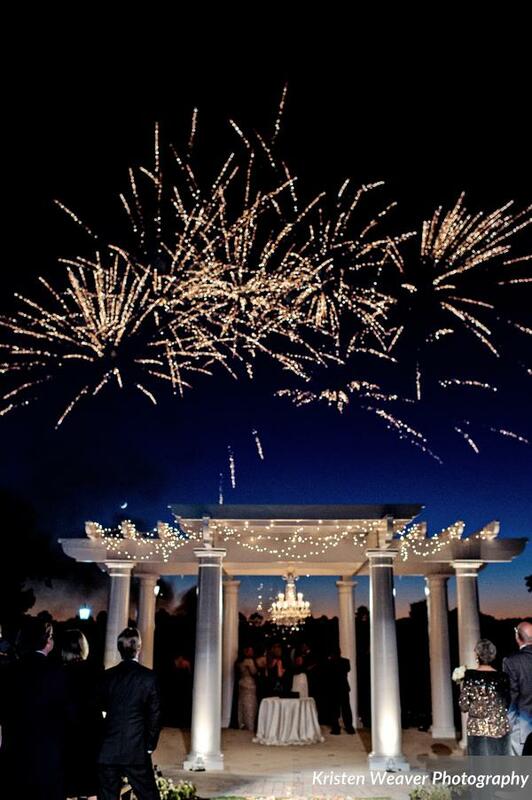 The couple timed their vows perfectly so that fireworks went off right afterwards! 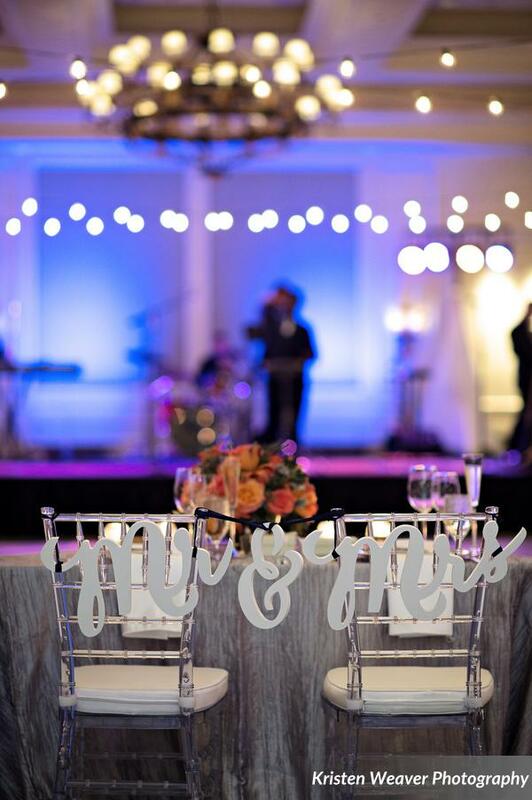 For the reception, we created custom silver trees dotted with clusters of orange floral. 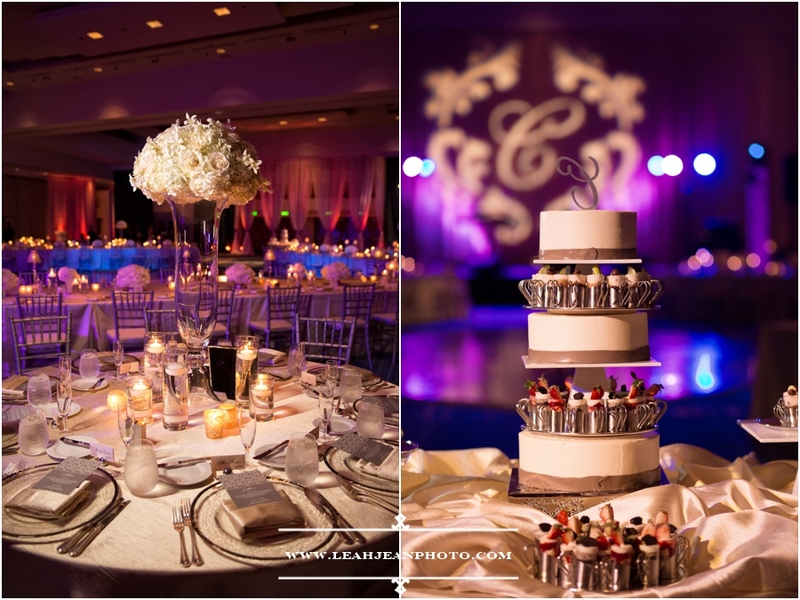 At the base of each arrangement was a bed of moss and succulents surrounded by candles. 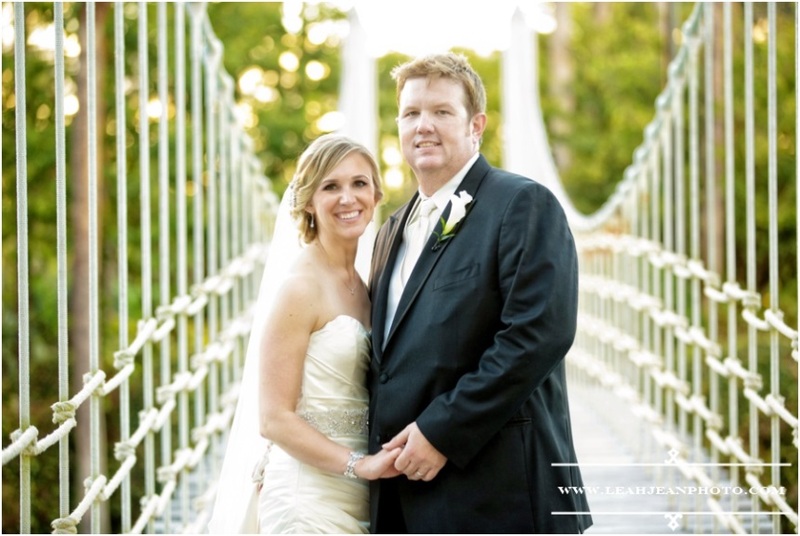 Congratulations, Julia and Dave! 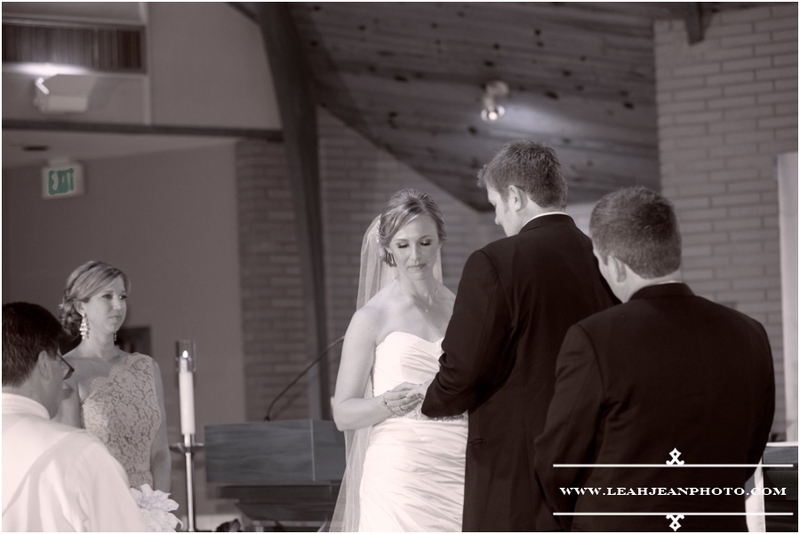 We are so happy for you both and wish you a wonderful marriage. 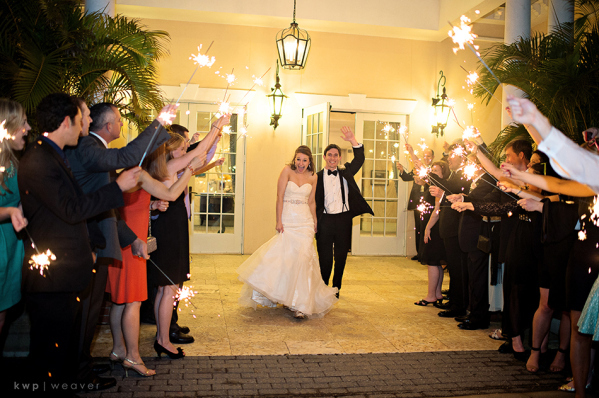 Anna and Houston said “I do” at First Baptist Church of Orlando in front of family and friends who were lucky enough to watch their love grow the old-fashioned way. 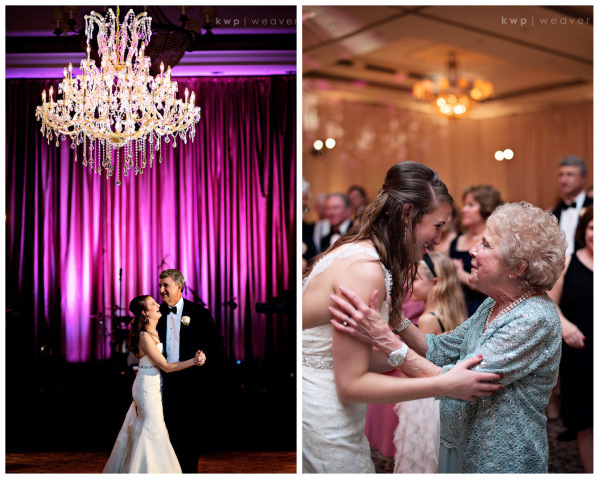 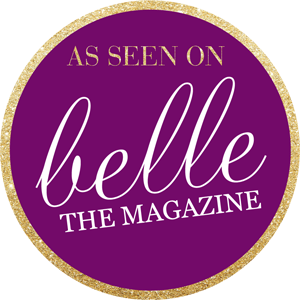 Love, tradition and Southern hospitality were the key ingredients to this beautiful event. 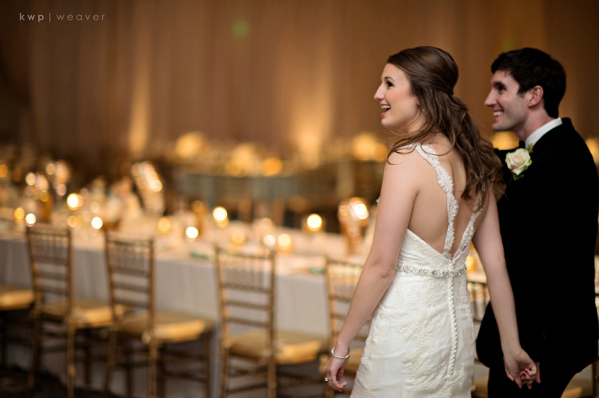 This couple’s compilation of love was all captured by Kristen Weaver Photography’s attentive eyes. 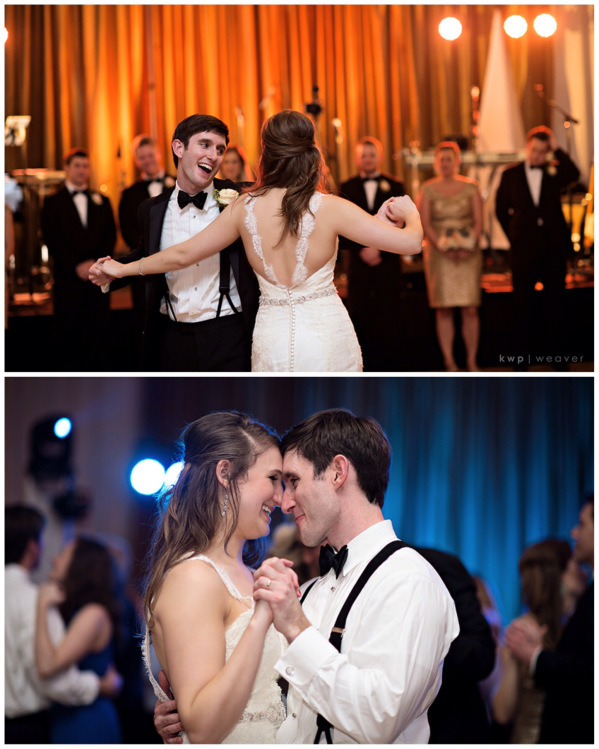 Amongst all the martial fuss the couple stole a moment to feel each other’s excitement. 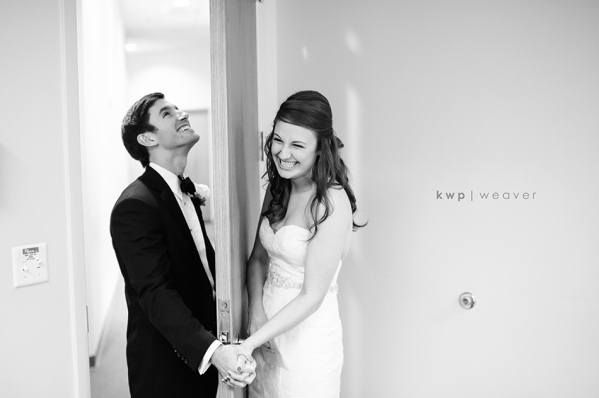 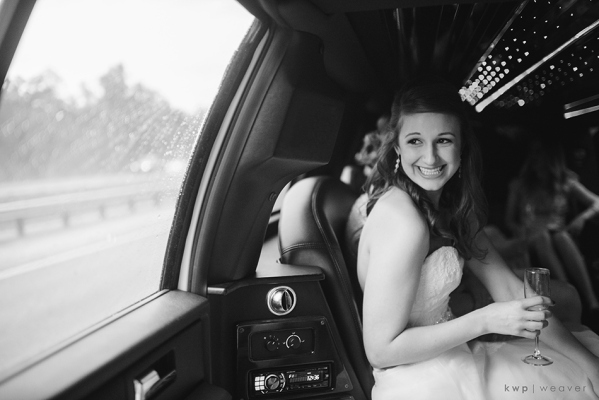 With the help of a door to allow for this special moment, the couple side-stepped any bad luck. 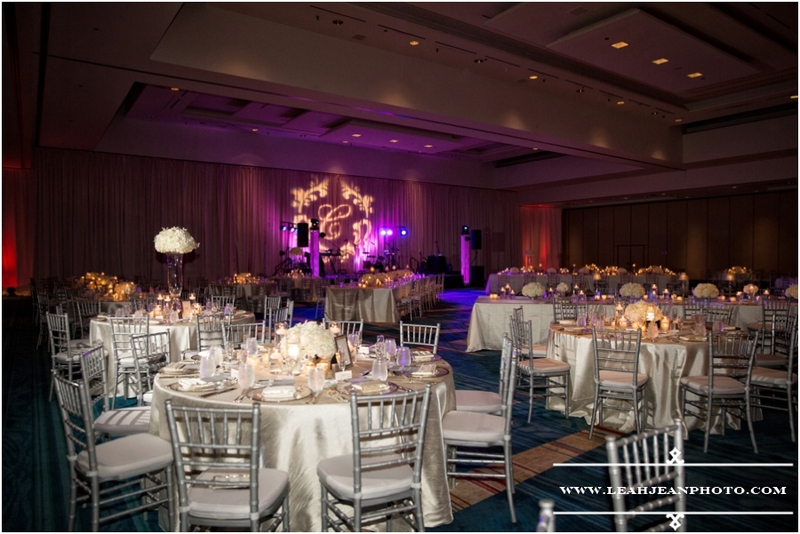 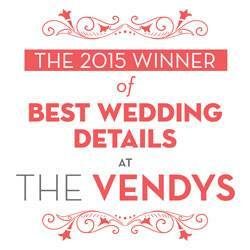 We proudly contributed the bouquets and centerpieces at this joyous occasion. 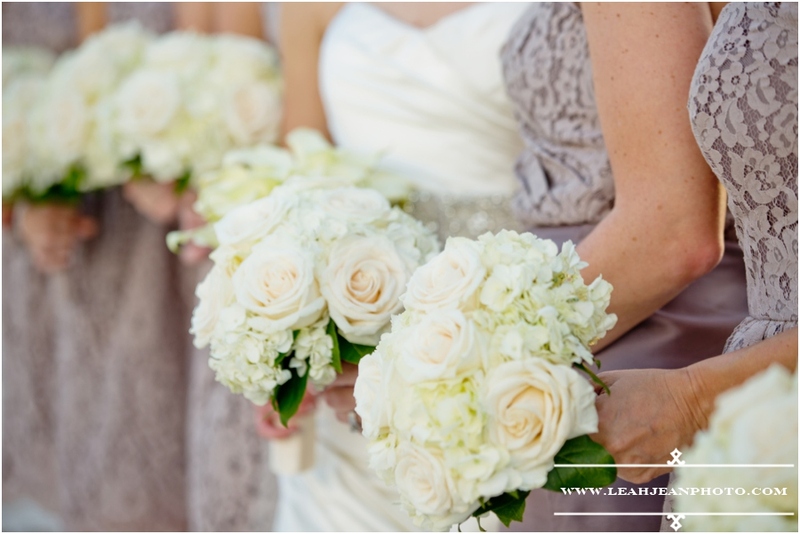 The bride held a bouquet of white hydrangea and soft pink roses. 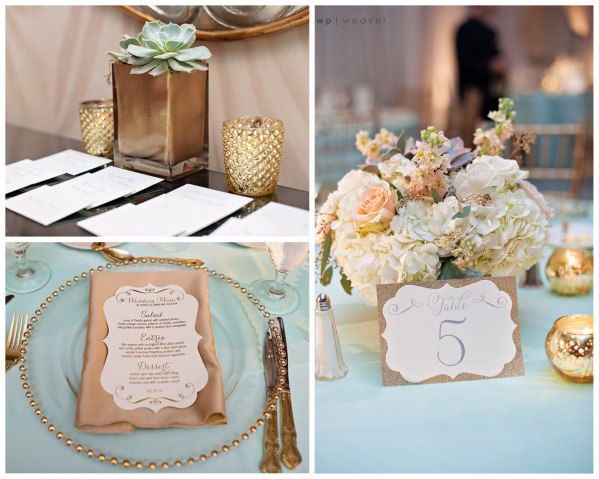 The bridesmaids and reception centerpieces were accented with succulents that added a little exotic pop. 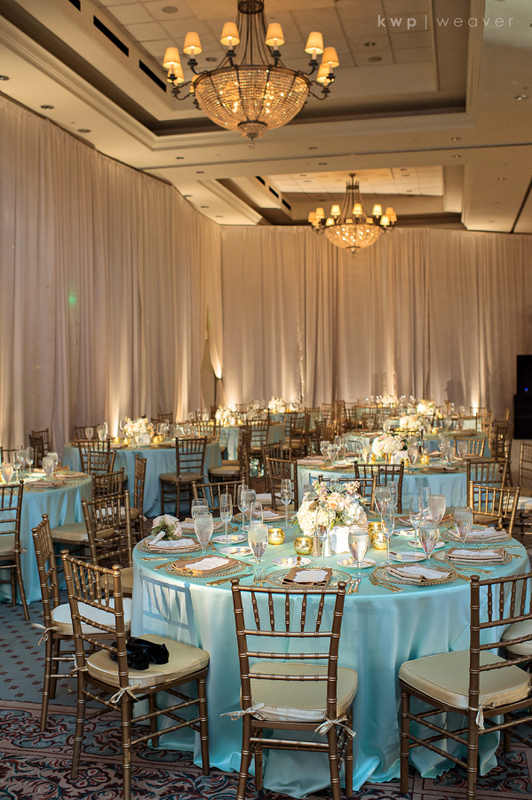 At the reception, gold chivari chairs, chargers & flatware provided by A Chair Affair cast a warm glow to contrast with the aqua table linens by Over the Top. 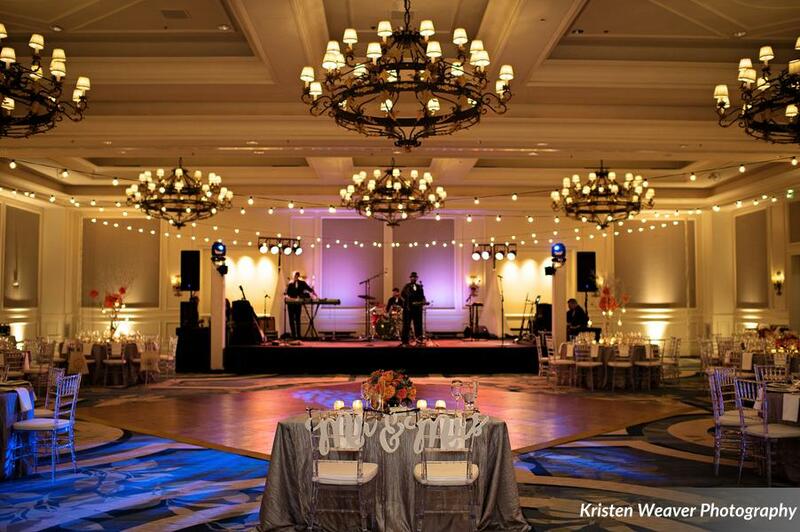 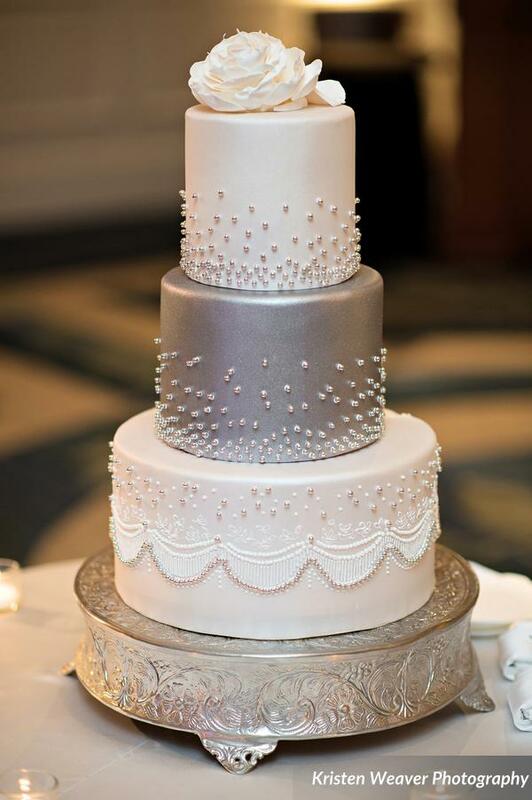 For the reception, guests gathered at the Grande Ballroom at Reunion Resort where tradition held strong as they danced with their parents, cut the cake by Party Flavors Custom Cakes together, and shared their first dance. 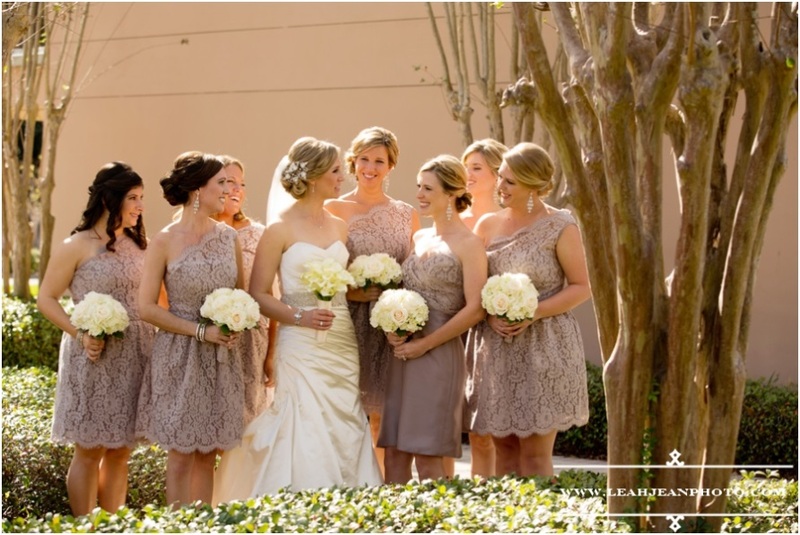 Anna and Houston’s wedding was full of love that cast a warm loving glow. 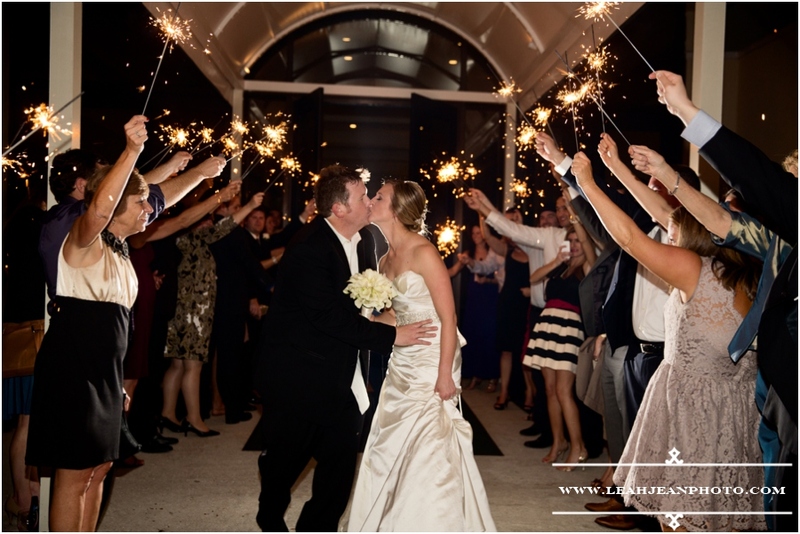 We wish the couple continued love and happiness for the many years to come.